Copyleft is a licensing system, were copyright law is used to enforce the removal of restrictions on distributing copies and modified versions of a work (including software works). In copyleft licenses such as the GPL, the owner of a copyright permits others to distribute their work (in either unmodified or modified form) but only provided the distributor (licensee) also allows others receiving the work to exercise the same freedoms. For this reason copyleft licenses are also sometimes known as "reciprocal licenses". Copyleft licenses are also sometimes described to as "viral" on the basis that once a work is placed under a copyleft license, then additions to the work are also usually placed under the same copyleft license and so on. On the whole, the viral description tends to be frequently used by critics of copyleft licenses, whereas proponents generally point to the fact that derivative works can usually only be legally created with the copyright-holder's explicit permission for proprietary licensed software. 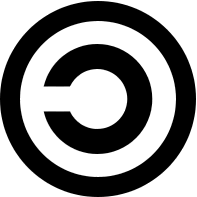 A symbol of a reversed letter c in a full circle (as opposed to a normal letter c in a full circle) is sometimes used to indicate that a work is copyleft, although unlike the copyright symbol, the copyleft symbol doesn't have a particular legal meaning or effect. "Strong Copyleft" licenses (example: GPL) , are licenses where all derivative works must be distributed under a copyleft license, whereas "Weak Copyleft" licenses (example: LGPL) only require some derivative works to be distributed under a copyleft license. "Full Copyleft" licenses cover an entire work, whereas "Partial Copyleft" licenses only cover particular parts of a work.